Despite living through these uncertain times, Kosztolanyi presents a detached, sardonic view of the political ups and downs, viewed initially from the Vizy household, a middle-aged couple who have suffered under the rule of the proletariat. There’s an element of farce about the way in which their caretaker, Ficsor, his short stint of superiority over, is eager to impress upon the Vizys his willingness to resume his former deference. What better way to re-establish class relationships than to offer Mrs Vizy a maid? This doesn’t, of course, elicit praise from Mrs Vizy – praise, after all, spoils a servant – but instead simply makes her fear that she will lose Anna. (Later, when Anna is offered the opportunity to marry, Mrs Vizy ‘falls ill’ and tells her “don’t waste your youth.”) Perhaps the best example of Anna’s treatment by the Vizys is when she receives as a Christmas present a gift the previous servant had disdained to take with her when dismissed. Of course, as the novel has already demonstrated, it is a distance that cannot be bridged – there are already warning signs when Jancsi tells his friend that the woman he is seeing is an actress called Marianne, and is then surprised when he doesn’t recognise Anna from his description. 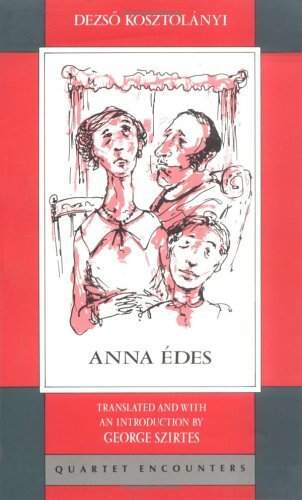 Kosztolanyi’s sympathies lie entirely with Anna, yet he neither romanticises her nor treats her as a ventriloquist’s dummy. In fact, she remains almost as unknowable to the reader as she does to the Vizys, making her later actions all the more shocking. The mocking tone used elsewhere never alights on her, creating a powerful political statement in a novel which seems so dismissive of politics. Anna’s exploitation shows that the real issue is how we treat each other, which is probably why the novel feels just as relevant today as ever. The visit to the restaurant leads to numerous re-acquaintances and an invitation to the theatre. Before long Akos has re-joined the Panthers, a gentlemen’s club which spends Thursday nights in drunken abandon. 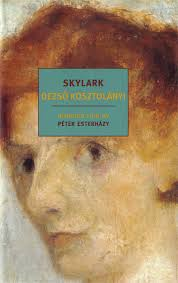 Skylark isn’t completely neglected by Kosztolanyi as we learn a little of her holiday, but the novel is about the freedom the parents find without their child rather than the more traditional reverse. Beneath all this, Kosztolanyi is making a darker, more profound point. The Vajkays’ sudden liberty betrays the stifling nature of their life. This, they believe, is a sacrifice they make for their daughter; but she has own hidden misery, accepting at the end that she will never marry. It is this that lies at the centre of the novel, and while today the state of spinsterhood may not be most parent’s greatest fear, the novel is portrays a very modern anxiety of parenthood. You are currently browsing the archives for the Deszo Kosztolanyi category.